Imagine you run a grocery store and you are selling fresh fruit and vegetables as well as typical consumer packaged goods. At your deli counter you sell fresh cold cuts like turkey, beef, chicken and ham as well as a variety of fresh cheese. And you slice and package it at your customers’ choice. Your customers order by weight and decide if they want to have their slices thin, medium or thick. And at your butcher’s department, you offer meat and poultry that is not pre-packaged but really fresh. Steaks cut in the desired thickness and packaged either in paper or in vacuum. Ground prepared in front of the eyes of your customers. To put it in a nutshell: you sell fresh high-quality food and your customers love it. And that’s why they come back and buy at your grocery store again and again. Now imagine you want to extend your grocery business and sell over the internet. You want to participate in the fast-growing e-commerce market for food. And as you want to be sure your high-quality food is still fresh, when your customers receive it, you do the delivery with your own cooled trucks. Furthermore, it is important to you to run a sustainable business with as little packaging as possible and short distances from your grocery store to your customers. You sell in your region and you are not sending parcels throughout the country. Now, what if there was a software that perfectly supported your needs to run this very e-commerce business? What if the software was proven already in the grocery market and you didn’t have to pay dearly? What if you even didn’t have to invest big money upfront but you paid for the software only based on the success of your grocery e-commerce business? The SAAS Food Commerce Cloud is the right solution for your grocery e-commerce business. Our cloud based software supports you in all aspects of selling food online. The Internet will no longer be a threat to your stationary supermarket – instead it will help you to maintain and grow your traditional grocery business. E-commerce of other companies will no longer be a problem for you. E-commerce will be your chance to benefit from a booming market segment. Our demo store Grocer’s Cloud gives you an idea of how our software SAAS Food Commerce Cloud works and what it could look like in the eyes of your customers. In addition to the feature-rich but easy-to-use online-shop there is a very powerful resource planning in the backend. With this cloud-based software you manage your products, check orders and do the complete fulfillment. And all this you can do in your existing grocery store. The software provides you with picking lists, packings lists, delivery notes, invoices and much more. Interested in selling your fresh groceries online in your region? Contact us – we are more than happy to give you a presentation on our SAAS Food Commerce Cloud. Read the case study about our customer NATURGUT, a real supermarket for organic food with ten branches! 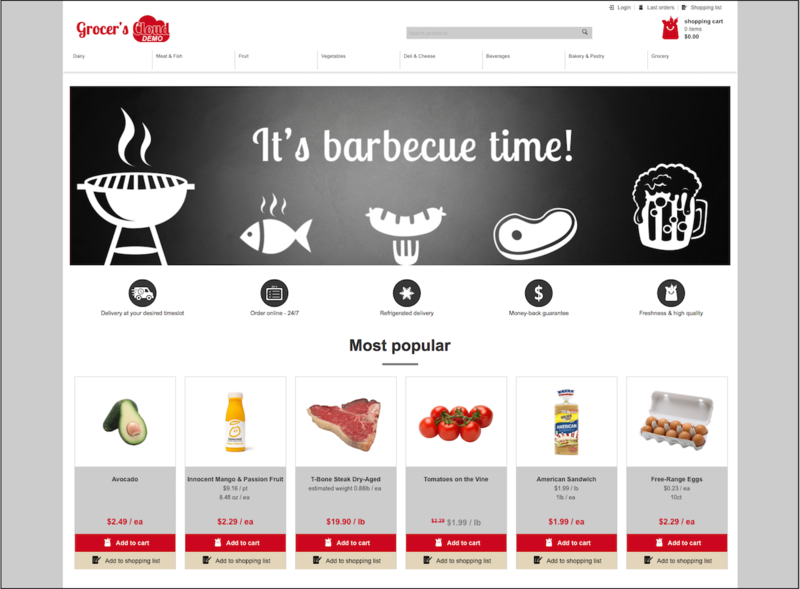 Want to read the case study about our customer Lieferladen.de, a pure online supermarket?